The path of each human life is unique, it has a richness, is even exemplary in that it shows how one person is situated in the context of a given period of history. Writing a book about a man means trying to assess what his main activities were, and to understand what he left behind him in his field of work. The decision to choose Adam Politzer was in itself a way of paying homage to this Viennese physician. No one today contests that he was, and still is, one of the key figures in the development of otology, the branch of medicine which deals with the ear. He is often considered one of the most eminent otologists of all time and the founder of modern otology. Publication details: Book. 2010. xiv and 333 pages. Publication date: 2010-09-06. Hardbound, with many color illustrations. A4 (8.3x11.7 in). Well into the 19th century management of ear disease by the medical profession was usually ineffective and occasionally hazardous to the patient. Few reputable physicians were willing to risk their reputation by becoming known as an ear specialist for fear of being associated with "aurists" who were often outright quacks. Adam Politzer is widely recognized to be the father of scientific otology. Politzer's categorization of ear diseases was based upon rigorous clinical observation. His fervent desire to design therapy to remediate the underlying pathophysiology of the ear was ground breaking in his day. As these are the fundamental tenets of contemporary medicine, it could be more accurately said that Politzer was the first modern otologist. Politzer created a highly influential center of learning in his Vienna clinic focused on the diagnosis and treatment of ear diseases. In the late 19th and early 20th century, his Vienna clinic was a virtual mecca for those seeking the highest possible level of education in otology. As a measure of the longevity of his influence, Politzer's textbook of ear diseases remained the standard reference in the field for nearly a half century. Although it would be hard to overestimate the importance of his contributions to the development of otology, his efforts ought to be viewed in a larger context. Politzer was a member of the 19th century group of surgeons who helped to transform surgical culture from merely serving as technicians who acted under the instruction of the wise and humane physician, into a field with much greater intellectual focus. Politzer's was more than just a prolific author. His works reflect the gravitas of a serious and committed scholar who was both classically educated and tireless in his commitment to excellence. A young 21st century aspiring scholar can draw much inspiration by reading Politzer's work. Politzer's love of study and learning carried over into his retirement years when, after voluminous research of literature written in many languages, he wrote what has been up to this time the definitive history of otology from antiquity through the 19th century. It is remarkable that it took 90 years to pass after Politzer's death for his first comprehensive biography to appear. The explanation for this lengthy delay lies in the difficulty of the undertaking. Albert Mudry comes to the task with unique qualifications. As a practicing otologist he spent a dozen years completing a PhD in history at the University of Lausanne. This training provided him a familiarity with the methods of historical research rare among clinically active physicians and unique in the world of otology. Over his two decades of historical scholarship in otology (1990 - 2010), Mudry has contributed over 70 publications in the history o otology in leading journals. His biography of Adam Politzer represents his Magnum Opus: It is the product of many years of diligent investigative research in libraries and archives supplemented by original material gleaned from Politzer family sources. The life and works of Politzer are analyzed in the sociological and political context of 19thand early 20thcentury Europe, especially his early life and student years in Hungary and his long career in Austria which spanned world war I. The subject of Politzer's Judiasm, which both shaped his intellectual heritage and made him subject to persecution, is appropriately explored. As both a Swiss citizen and a student of languages, Mudry has the necessary linguistic skill to digest primary sources in German, French, Italian, English, and Latin. The intersection of otologic expertise with both advanced historical training and wide linguistic facility represents a rare congruence of skills. That they have occurred in an individual who possesses an indefatigable passion for historical study is extremely fortuitous for the fields of otology and the history of medicine. Although Mudry's historical research has been partially funded by the Swiss National Fund for Scientific Research, he has been exceptionally generous in terms of both time and materials. Mudry has become widely recognized as the leading historian of otology in our era. In this sense, he is following in the footsteps of Politzer. Unlike his idol, Mudry has the important advantage of having entered this field as a relatively young man and hopefully will enjoy decades more of productive historical research. He also possesses all of the advantages of a researcher in the digital age. With his keen eye for posing interesting questions and choosing con-sequential subjects worth of study, those of us who share his passion eagerly look to his future contributions. My hope is that Mudry will take up the challenge of creating a 21stcentury comprehensive history of otology timed to appear around the date of the centenary of the publication of Politzer's classic two volume tone. The Politzer Method or "Politzerization"
Click here for a review by Jaydip Ray as published in ENT & audiology news. It is widely agreed that one of the greatest otologists of all time is Adam Politzer, repeatedly referred to in the literature as the father of our specialty. A student of history, Politzer helped define a medical specialty in the 19th century and made numerous advances in the field. Despite this influence, a comprehensive biography of him has not been written, until now. 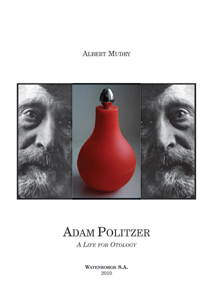 The book, Adam Politzer: A Life for Otology and Neurotology by Dr. Albert Mudry, is a valuable, scholarly, and detailed examination of Politzer's life and influence on our specialty. Mudry comes to the task with unique qualifications to make this a success: a career in otology, more than 20 years of historical scholarly works with a doctorate in medical history and the arts, and fluency in all the languages required to review the primary sources, including Latin, French, Italian, English, and German. The book begins by exploring the medical-historical context to which Politzer was born into and his early childhood and family life. His research studies are explored in detail, as are his mentors, a veritable "who's who" of 19th century medicine and science, with such notable figures as Rokintansky, Skoda, Hyrtl, Müller, Ludwig, Helmholtz, Tyonbee, and von Tröltsch, to name but a few. His work on the physiology of the ear and the development of the "Politzerization" maneuver is described in brilliant detail, as are his studies on the pathologic anatomy of the ear. The book then goes on to describe Politzer's work as a clinician and the development of his profoundly influential clinic in Vienna. This section includes wonderful descriptions of his work on otoscopy, his artificial tympanic membrane, and catheterism of the Eustachian tube. Subsequent chapters include descriptions of his work as an influential teacher while otology was emerging as an independent subspecialty in the late 1800s and his groundbreaking scholarship on the history of otology. Perhaps the most interesting chapter deals with his artistic skills, widely hailed at the time for their extraordinary detail, and includes multiple examples of his illustrations of ear disease. The book ends with a discussion of his private and home life, his descendants, and subsequent influence. The hardcover book itself is of a large format with high quality image reproductions, impressive appearing on any collector's bookshelf. What Albert Mudry has crafted is a beautiful, scholarly, and magnificent work dedicated to the founder of our specialty. It certainly belongs side by side with Politzer's own historical writings, on equal footing and of equal importance. Copyright © 2011 Otology & Neurotology, Inc. Unauthorized reproduction of this article is prohibited. THE EARLY 19TH CENTURY GAVE BIRTH TO A SCIENTIFIC MOVEMENT in central Europe that would transform medicine. Propelled by the newly realized powers of experimental physics and chemistry, an explosive increase in laboratory experimentation would replace unproductive, timeworn descriptions of human disease-descriptions that failed to address cause. This movement would replace the prevailing understanding of physiology, which was, according to Francois Magendie, "what it was in the time of Galen, a game for the imagination." As clinicians extended the reach of physiological experimentation, new insights into pathology and new strategies of treatment would emerge. In Adam Politzer Volume 1: A Life for Otology, Albert Mudry offers an account of the life, career, and times of the individual who would fully apply this emergent approach to the study of the human ear and in doing so become recognized as the founder of modern otology. Mudry's biography offers key insights into the progression and maturation of the many milestones of Politzer's life. In recounting Politzer's early experiences, Mudry describes a Hungarian upbringing that would serve as a springboard. The unification of Austria and Hungary brought educational opportunities that would take Politzer to the prestigious scientific centers of Austria and beyond. Medical study in Vienna offered the freedom to choose courses as well as instructors. Mudry emphasizes the effect this freedom had on the trajectory of Politzer's career. In his Viennese medical training and postdoctoral laboratory training, Politzer armed himself with lessons and techniques gathered from a cadre of prominent, avant-garde mentors who would become known internationally for the rigor of their scientific pursuits. Politzer's training sowed the seeds for remarkable triumphs later in his career. Throughout his professional journey, Politzer swept aside traditional clinical practices in favor of the precision and clarity of direct experimentation. He described the acoustic transfer that subserves human hearing in the context of graphed data of ossicular motion. The open questions of middle ear physiology and critical linkages between barometrics and middle ear aeration yield novel pressurization techniques. Such treatment offered an effective approach to preventing otitis media, a disorder of enormous prevalence in the preantibiotic era. Politzer's myringotomy, tympanoplasty, and mastoidectomy procedures are described with prescience of their utility for future centuries, as are his pioneering insights into the mechanism of ear pathology. Merging histology and physiology, the pathologic basis for otosclerosis was differentiated from mucosal disease, giving rise to enduring strategies of treatment of the associated hearing loss. In addition to his own studies, Politzer established his reputation as a mentor without peer. Included among his many trainees was Barany, who would go on to win a Nobel Prize for his description of caloric testing of the vestibular labyrinth. In the 1860s, Politzer played a central role in advocating that otology become an independent medical specialty. In this, he clearly embraced the notion advanced by Ménière that an enlightened specialty places its practitioner "in a better position to remedy." Mudry argues convincingly that subspecialization occurs with an in-depth understanding of pathology and with advancing technology. To be sure, economic and sociological forces can influence medical subspecialization. Politzer added impetus to these forces and launched the first journal devoted entirely to diseases of the ear in 1863. Given the relative inaccessibility of the inner ear to direct study, reported research on otopathology was emphasized as being critical. Without it, Saissy asserted, for example, that for hearing loss, "there can be nothing but uncertainty in our acquaintance with the causes." In addition to Mudry's professional experience as an otologist, his formal training as a historian and his facility with multiple languages offers him unprecedented access to primary sources. Mudry is thus able to capture the wide range of influences on Politzer's career beyond his formal training. Information about Politzer's spiritual motivations; the design and decor of his clinics and home; his personal finances; and his correspondences, friends, and (more interestingly) adversaries make for a fascinating read. The role of aesthetics in Politzer's life is particularly compelling. Mudry explores Politzer's talents as an illustrator and painter whose love of art was fundamental to his career. "The search for beauty was always present in his work," Mudry offers, whether it was Politzer's eye-catching depictions of the intricate bridgework formed by the ossicles and their mucosal folds or the beauty of elegant ideas. For readers whose careers have been driven by a fascination with the ear, this book is a must. Moreover, Mudry's well-referenced survey of 19th-century Europe and the forces that would influence the evolution of medicine offers insights to all medical readers through Politzer's remarkable and well-told life story. Conflict of Interest Disclosures: The author has completed and submitted the ICMJE Form for Disclosure of Potential Conflicts of Interest. Dr Mudry is a regular reviewer for the journal Otology & Neurotology, over which Dr Niparko serves as editor-in-chief. ©2011 American Medical Association. All rights reserved. This book is a realistic tribute to Politzer's life, activity and contribution in establishing modern otology as a separate specialty in medicine. When one finishes reading the book does not feel an exaggeration of accepting the formal term: Adam Politzer is the father of modern otology. The biography does not only speak about the facts in Politzer's career. A serious effort is taken by Dr. Mudry to embed the milestones of Politzer's life into the context of the development of medicine in the second half of the nineteenth Century, the actual social affairs in Austria, and the teaching features and responsibilities in the universities in Europe and especially in Vienna. The book is a translation of Dr. Mudry's PhD dissertation. The work tries to gather as much information and relics from Adam Politzer's professional life as possible. These are photographs (145) of contemporary medical devices, some of them are Politzer's own inventions like the Politzer balloon; research tools for examining the sound transmission in the middle ear and the Eustachian tube. A lots of portraits of Politzer's teachers (Rokitansky, Skoda, Oppolzer, etc.) and research supervisors (Carl Ludwig in Vienna, Hermann von Tröltch and Albert von Kölliker in Würzburg, Hermann von Helmholtz in Heidelberg, Claude Bernard and Rudolf König in Paris) are included in the book. It introduces us the process of how the specialty of otology could be developed among controversies and friendly cooperations between the contemporary specialists. The book figures out, that a genius cannot be well prepared for successful professional life without great teachers. For Politzer, those teachers were Rokitansky, Oppolzer, Hyrtle etc. at the very highly ranked Vienna University, Faculty of Medicine. The graduate study was followed by an international study trip for 2 years. This made it possible to learn from von Tröltsch in Würzburg, von Helmholtz in Heidelberg, from Claude Bernard in Paris and from Joseph Toynbee in London. These are the greatest names in contemporary physiology, physics and otology in Europe. During this trip, Politzer received deep anatomical, physiological and pathological insight into the most actual knowledge about middle and inner ear and their function in hearing. The function related aspect of anatomy remained the guideline in his life. An important part of the book is to demonstrate Politzer's teaching ambitions and the successful way it was performed by him. A professor, who speaks English, Italian, French and of course German and with classic languages as Latin and Greek in addition, made Politzer to be able to explain all the crucial details about the external and middle ear anatomy, pathology and treatment in a so perfect way during his otology courses that it ranked Politzer to be the most eminent teacher of otologists in the contemporary world. In spite of Politzer's jewish origin and the antisemitism in Vienna, Politzer received the highest acknowledgement possible in a university career from the political elite, including Emperor Franz Joseph of Austrian-Hungarian Monarchy. The book shows up those additional factors, which were significant in the success of Politzer's wishes to establish otology as a separate medical specialty, e.g. his artistic capability of producing excellent demonstrations of pathologic eardrums: paintings of otoscopic pictures of sick tympanic membranes, sculptures of temporal bones from plaster cast for exhibition. A rich collection of short biographies of contemporary otologists, physicians, the full list of Politzer's publications, letters from participants of the otology courses are added in seven annexes. Explanatory notes of 1,025 can be found at the end of the book. This book can be recommended to everybody who would like to see the scientific challenges of the nineteenth century in otology, and for those who would like to gain a clear picture of a great scientist, physician, teacher, artist and historian of our specialty. Copyright © 2011 Springer-Verlag 2011 Unauthorized reproduction of this article is prohibited.